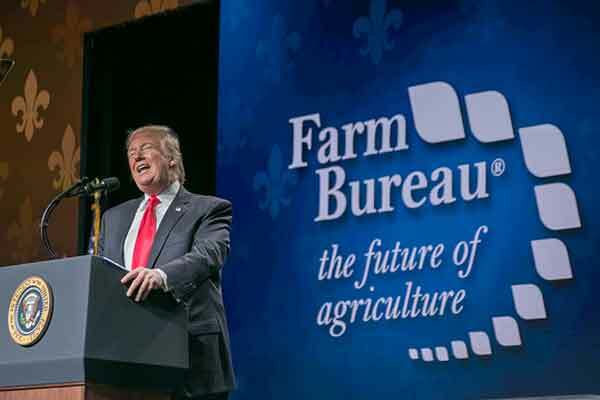 In the middle of his speech Monday to members of the American Farm Bureau Federation, President Donald Trump was explaining the need for a wall on the southern border when the president asked a 79-year-old Arizona rancher to come on stage and say a few words. Chilton also said he was as surprised as anyone that Trump would call him onto the stage. “None of this was scripted. He just did it,” Chilton said. The moment was one highlight in a speech that seemed to recharge the president in the midst of a 24-day partial government shutdown as his fight with Congress over funding a border wall continues. The president fed off the energy of a positive crowd who showed Farm Bureau members continue to support him. “We’re going to have a wall. We’re going to have a barrier,” Trump said to the roar of the crowd. While Trump was passionate in making his case for Congress to fund a wall — calling on Farm Bureau members to call Democratic members of Congress — the president did not say anything about using emergency presidential powers to build a wall. Zippy Duvall, president of American Farm Bureau Federation, said it was no surprise Trump would talk about the border wall. “What surprised me was the reception he got from our people was a lot stronger on that than it was last year,” Duvall said. Trump bounced back and forth between his focus on the wall and his administration’s push for trade deals. While the last USDA farm income data shows a 12% overall decline in farm income from 2017 and agriculture’s trade balance is declining, the president put a positive spin on agricultural trade conditions under his presidency. “It’s only going to get better, because we’re doing so many trade deals that are going to get you so much business you aren’t even going to believe it,” Trump said. On the border wall, the president said his first responsibility is to defend U.S. security, and said past administrations failed by not securing the southern border to stop the flow of illegal immigrants and drug traffickers. The president said Immigrations and Customs Enforcement has arrested more than 100,000 people in the past year who had criminal records. “Women and children are being ruthlessly exploited at our southern border by vicious coyotes and human traffickers,” he said. A border barrier also will make it easier for the U.S. to bring in the people the U.S. wants to come, Trump said, alluding to guest-worker programs. Trump alluded that farmers would be able to bring back people legally who may have been working for them illegally in the past. Trump reiterated some comments he has made throughout the arguments on the border wall, saying that, where barriers exist, crossings plummet. While Democratic critics have called the wall idea “medieval,” the president compared walls to wheels as simple technology that still works. “Wheels work and walls work. There are some things you can’t beat,” he said. While much of USDA is closed, Trump said USDA is working for farmers during the shutdown. He also reiterated that many of the 800,000 or so federal workers who are not getting paid still support what he is doing. The president then rattled off that his administration has virtually eliminated the estate tax by raising the asset exemption, while also making 15% ethanol blends available year-round, though EPA has not yet promulgated that rule. “We’re making E15 available all 12 months, that’s a big difference for the farmers,” Trump said. Then Trump touched on EPA’s waters of the U.S. rule. He said the EPA rule under the Obama administration “sounds so beautiful,” but that “It was a total kill on farmers, builders, on everybody.” Trump then talked about a North Dakota farmer family that would have faced “tens of thousands of dollars” under WOTUS because farmland they wanted to buy was in the Prairie Pothole region. “They said my poll numbers are very bad in Europe. Well, they should be,” Trump added. Over the last 15 years, Trump said, there was a decline in the share of U.S. agricultural trade — though USDA cites that U.S. agricultural exports peaked in 2014 at $152 billion, and the agricultural trade surplus in 2014 also peaked at $43 billion — but that new trade deals will turn the tide for farmers. The president listed countries that have agreed to buy certain agricultural products such as beef, rice or pork in the past two years, including Argentina, India, Indonesia, Japan, Brazil and beef to China. All of that happened because the White House asked for it, Trump said, but those open markets will look small once new trade deals are done. “That’s peanuts compared to what we’re talking about,” he said. Then he turned to the United States-Mexico-Canada-Agreement, calling it “a whole different world” compared to the old NAFTA, which Trump said “was one of the worst trade deals ever made by a country. It killed our country.” Now Canada will grade U.S. wheat the same as their own, and Canadian dairy markets will open up more to U.S. producers. “I hear it’s in very good shape and it replaces something that has been so bad to our country,” Trump said. Trump capped off his speech by championing farmers as loyal Americans, which drew another standing ovation. “Now you have a government that is loyal to you, finally, in return,” he said.